R's sister emailed that she was sending me a DVD of their family's home movies. When I checked my mail yesterday, there it was. I had seen the home movies in R's family's living room in the distant past and never imagined that I would see that footage of R and his family again after all these years. 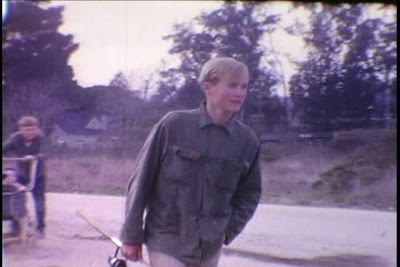 The home movie clip where the image above originated was probably taken in the winter of 1965("in the winter of '65, we were hungry, just barely alive" -- The Band), when we were 16, a year before R and I met, three years before he was drafted into the Army. When we were 52, he told me that he had almost died from a drug overdose just before he met me in December of 1966. In my first days of friendship with R, he frequently surfed as well as fished at Miramar Beach, which is across Highway 1 and down the road from the house where he lived with his mother and father and six of his siblings, the youngest of whom were fraternal twins born in December of 1964. His oldest brother may well have been married by then. His next older brother was in the Army in Thailand. R had become the oldest one who lived at home. He had dropped out of high school and had started working odd jobs and possibly selling drugs. Somewhere I have a drawing I did of him as he stood facing the ocean with his fishing pole. At 16, I was an extremely shy young woman who loved horses, the ocean, swimming, drawing, the Beatles and Bob Dylan --a girl who spent hours and hours in her bedroom reading books and other hours and hours walking great distances with our family's dog, exploring deep into the countryside outside of city limits. I was 16 and "never been kissed." My self-esteem was so low that I couldn't imagine that I ever would be kissed. Unable to imagine that I would ever be married, I had the notion that I wanted to be a nurse, and so I volunteered in the pediatrics ward of a nearby hospital as a "Candy Striper," talking with childen who were hospitalized. It didn't take me very long to discover that my life, difficult as it appeared to me, had been a sheltered one. A young boy I talked with calmly told me that he was in the hospital because his father had stabbed him in the stomach with a knife. I had no idea what to say to him beyond that I was sorry that had happened to him. I was in way over my head, not sure at all that I could ever be useful as a nurse or anything else, for that matter. All I knew for sure was that now I wanted to be with R.
After having met R in December of my senior year in high school, I would drive my parents' car to the hospital on Sundays to volunteer my hours and then drive out to the coast, hoping to find R walking on the beach. I told him about the boy. He told me about his friend whose father would get drunk and chase him around the house with a knife. R told me that he never wanted to be a drunk. Drugs, yes. Alcohol, no. It was R who called me from California in 2001 and let me know that George Harrison had died. Two weeks after he returned from Vietnam in 1970, he had given me a copy of George Harrison's double album, "All Things Must Pass" as a Christmas present. George Harrison and R both died from brain tumors, but R survived his first bout of lung cancer, going into remission in 2002 and living until April of 2008. He returned to drug and alcohol abuse in those years, and his capacity for physical and emotional abuse of me was clear. For my physical and emotional safety, I had to keep my distance. I detached from him -- first with fear, then with anger, then with love. Anger and fear alone would have killed me. A year ago yesterday, R suffered acute respiratory failure at the VA hospital but was resuscitated and placed on a ventilator and feeding tube in the ICU. Although I was unaware of what had happened to R that Friday, I had a strong urge to call the VA hospital that weekend. Something else told me not to call but I struggled with that something else until Easter morning when I made the call. His nurse must have thought I was his sister or another nurse and told me everything about his medical condition, including the part about the stage IV brain tumor. In shock, I just listened. She told me that as he was being transported to the ICU, she had asked him a question to see if he was oriented. He spoke in the only way he could, with a "thumbs up." When I heard that, I felt sure that he was going to be okay. "Unable are the Loved to die/For Love is Immortality"
In 2001,when we were 52, R said that the only thing real about him was his soul. "The soul does not love. It is love itself. How to Know God, page 130"
You know, I'm not really expecting comments on all this, but it does help that I can write this story as best I can and be heard. Like the boy in the pediatrics ward, I just need to say what happened. That a person I loved and should have been able to trust hurt me. I was implicitly threatened with a Bowie knife on one occasion after R returned from Vietnam and then later struck and knocked to the floor by R, the person I loved more than anyone in the world. I had to leave him but continued to love him. That there were times that I wanted him to hurt, too. It has taken most of my life to sort that out. I can say now that I've come a long way. I'm finding it harder and harder to call it a love story, but it is a soul story. Oh, Am. Hugs. Real love stories usually turn into different kinds of stories, I think -- in fact now that I think of it that may be how you can know they're real. I'm so sorry. Go gently. I think it is good and it is right and it is necessary that you are telling more of this story. Expression in words/paintings helps to clarify and heal. All good wishes. in a way, blogging allows for the kind of sharing that happens on an overnight train or bus ride when strangers get to share those bits of their story no one else really wants (or can bear) to hear. Sorting through. Naming the feelings. Understanding. Making something of it all, as best we can. Staying open to new patterns of being and relating. Making sense out of senseless events. Important work, but not easy, that's for sure. Here's wishing you light, funny and whimsical things today, just to balance out the rest. It's good to tell the stories. Dale, Solitary Walker, R.L. and robin andrea -- Thanks so much for your thoughtful comments in response to this story that becomes more healing each time that I tell it. am - in your description of loving horses, walked for many hours with your dog, spending time in your room... you could have been describing me at 16. I walked my dog for miles late every night after everyone was indoors asleep, in summer rode horses in the forests, and spent my "indoors" time drawing meticulous pen and inks that sometimes took days to finish. I was shy and quiet -- and am pretty much the same way to this day. For me, my first real relationship was with my husband and we were together most of our adult lives as we married when I was 18. It's very strange to go on without him. I'm sure you must be feeling much the same, even though you lived apart from R for so many years. By the way, I've been on the road for a little while now, so am just catching up reading your blog. I've been camping my way north through Arizona and southern Utah since leaving Bisbee. take care, bev. "I'll see you in the sky above, in the tall grass and the ones I love." Thanks so much for stopping in to say hello while you are traveling. Hearing about your journey has helped me with mine.